The Vision 110 +1 is a mid-range jerkbait designed to increase the depth of the original 110 by up to 3ft. The 110 +1s medium bill is crafted to eliminate the traditional issues of high water-resistance, fatigue, and deadened darting-action often associated with long-bill minnows, while at the same time preserving the legendary action of the original 110. By positioning the line-eye close to the body, water resistance is reduced in order to make it easier to work the 110 +1. Preliminary field-testing by the pro staff of Megabass indicates that it requires even less effort than the original Vision 110. 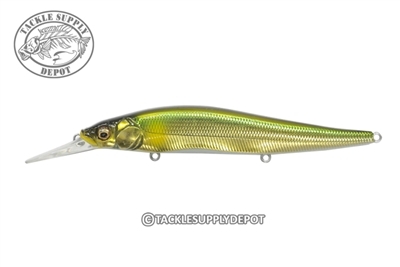 In addition, this angler-friendly design also channels more water towards the lure's forehead and along the carefully sculpted body, allowing for irresistible darting action with the slightest angler input. The Vision 110 +1 is finished off with sticky-sharp Katsuage hooks, two internal rattles, and a dual-tungsten Multi-Way Moving Balancer System (PAT) designed to produce superior long-distance castability even in tough conditions. The Vision 110 +1: The legend just got deeper.